Read a summary of OBRA '87, the full federal regulations, and the Medicaid and Medicare provisions. national campaign for nursing home reform. Learn about state-specific and federal regulations pertaining to nursing homes and regulation using "this searchable website [...] to examine and compare the content of state regulations related to nursing homes, the processes of regulation and exceptions to regulations within a state, recent state changes, innovative nursing-home designs and programs that were accomplished within existing regulations, and innovative state regulatory initiative." Read An Advocate's Guide to OBRA - "Ombudsmen and Citizen Advocate Action: The Key to Change for Residents," by Sarah Greene Burger. This guide spells out the significant details of OBRA '87 and the history of how it was developed. The Consumer Voice was instrumental in the development and passage of OBRA '87 through the Campaign for Quality Care, a coalition of advocates, providers, researchers, unions, professional organizations and others seeking reform. Read comments from consumers and advocates about the strengths and shortcomings of this important piece of legislation. 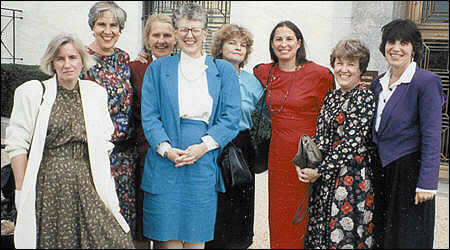 Nancy Lombardi, Elma Holder, Barbara Frank. Claude Pepper, both champions of reform legislation. The Senate Special Committee on Aging, chaired by Senator Herb Kohl (D-WI), held an oversight hearing Wednesday, May 2, 2007, titled “The Nursing Home Reform Act Turns Twenty: What Has Been Accomplished, and What Challenges Remain?” Consumer Voice Executive Director Alice H. Hedt testified. Watch a webcast of the hearing and read additional information. Toby S. Edelman, Senior Policy Attorney, Center for Medicare Advocacy, Inc., Washington, D.C.
Gerald Kasunic, Director, Office of the D.C. Long-Term Care Ombudsman Program, Legal Council for the Elderly, Washington, D.C.
Read the March 2007 GAO Report "Efforts to Strengthen Federal Enforcement Have Not Deterred Some Homes from Repeatedly Harming Residents." Washington Journal invited Alice to appear on May 3rd's program after reviewing her testimony on May 2, 2007, before the Senate Special Committee on Aging. The 30-minute interview covered a range of long-term care issues, and included questions and comments from consumers across the United States. Read notes on the consumers who called in during the segment. Ruth Morgan, Barren River District Long-Term Care Ombudsman, writes Bowling Green Daily News article "Column: Promise, unfulfilled potential in elderly care." Read the article, or visit http://bgdailynews.com/articles/2007/05/05/features/feat2.txt. 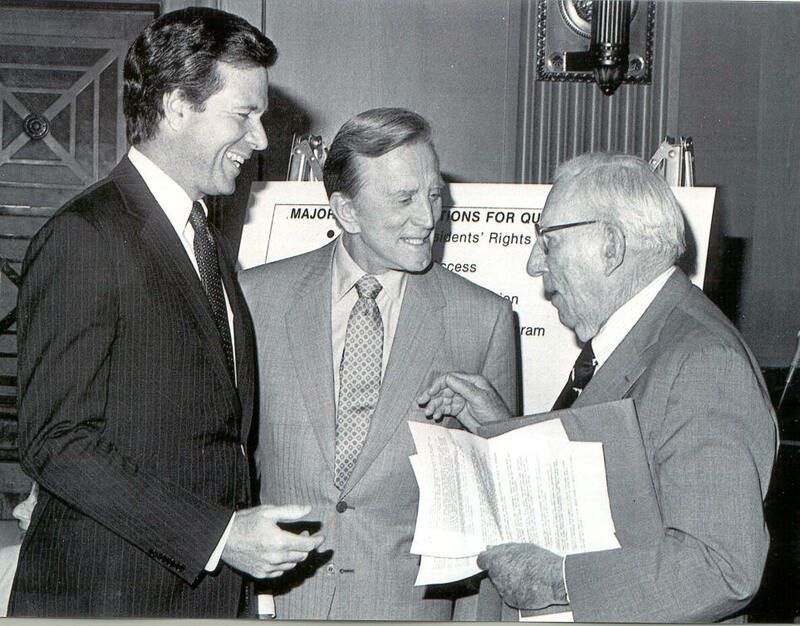 On December 7, 2007, the Alliance for Health Reform and the Kaiser Family Foundation sponsored a luncheon briefing. 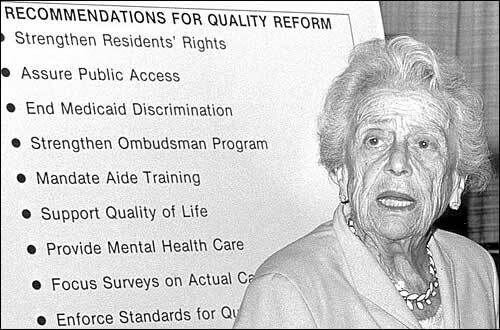 The Nursing Home Reform Law, which was part of the Omnibus Reconciliation Act of 1987 (OBRA ’87), was considered to be landmark legislation for nursing home quality improvement and brought high hopes to consumers, advocates and legislators. But some recent reports and congressional hearings indicate there are still concerns about quality of care. Twenty years later, what progress has been achieved? What’s left to do? Are legislative solutions the answer to improving quality? Can voluntary initiatives make a difference? Can the industry and policymakers find a cost-effective way to increase staffing and improve quality? The briefing helped to address these and related questions, and discussants were: Ruth Katz, George Washington University, and former counsel to the House Subcommittee on Health and the Environment chaired by Rep. Henry Waxman; John Rother, AARP; Susan Weiss, American Association of Homes and Services for the Aging; Elma Holder, National Citizens’ Coalition for Nursing Home Reform; Janet Wells, National Citizens’ Coalition for Nursing Home Reform; Paul Willging, Johns Hopkins University and former head of the American Health Care Association (AHCA); Christine Williams, former health aide to then-Senate Majority Leader George Mitchell; Bruce Yarwood, AHCA; Mary Jane Koren, The Commonwealth Fund, and former director of New York’s Survey and Certification agency; Joshua Wiener, RTI International; and Jack MacDonald, Golden Horizons/Beverly Enterprises, Inc. Additionally, the event began with the short video, Nursing Home Reform: Then and Now, produced by the Kaiser Family Foundation. Ed Howard of the Alliance and Diane Rowland of Kaiser co-moderated. All materials from the briefing packets are available on the Alliance for Health Reform's website. To download materials from the briefing, go to http://www.allhealth.org/index.asp. If you would like to receive a hard copy of the materials from the briefing or a copy of Kaiser Family Foundation's “Nursing Home Reform: Then and Now” on DVD, e-mail your name and address to info@allhealth.org. Staffing is essential to quality. View resources and information about staffing, including Consumer Voice's staffing standard. Learn about successful practices to improve and stabilize the workforce - visit the Paraprofessional Healthcare Institute's website. "Culture Change" builds on the important principles of OBRA '87: individualized care, respect for residents' rights, and resident/family involvement. Catherine Hawes' Written Testimony Before the U.S. Senate Committee on Finance: "Nursing Home Quality: Problems Causes, And Cures"
Join Consumer Voice. Help the Consumer Voice define and achieve quality for long-term care consumers. As a member, you will strengthen the national consumer voice and receive regular updates on long-term care issues. Click on the link above to learn more about Consumer Voice member benefits. Join a state Citizen Advocacy Group (CAG) working to improve long term care. Volunteer with your local ombudsman program. Encourage your own or your loved ones' facility to address consistent assignment and turnover through the Advancing Excellence Campaign. Support the Elder Justice Act. Learn about state and federal nursing homes and regulation by visiting http://www.hpm.umn.edu/nhregsPlus/. Call the U.S. Congress switchboard at (202) 224-3121. They will put you through to the Representative's office, and you can give your message to the person who answers the phone. Not sure who your current Representative is? Visit www.house.gov/writerep/ for a feature that will let you identify your representative by filling in your state and zip code, then send an e-mail message right from the House website.